Sylvia Ernestina Vergara emphasizes cultural and contemporary topics in her musical compositions, poems, essays, short stories and plays. Her concerns include environmental and social issues locally and globally. Presently, she is a recipient of Partners for Fish and Wildlife Program through the US Fish and Wildlife Service (New Mexico Ecological Services Field Office): a ten year project commitment concerned with restoring and improving habitat for migratory birds, declining, threatened, endangered, and candidate species and encouragement of pollinator habitat. Her focus is hydrologic cycle research and immune system awareness in nature. Vergara is a founding member of the Red Planetaria Mujeres Poetas and has been interviewed inOccursus Blog: Sylvia Ernestina Vergara: A “Whole-istic Artist.” Her poem is featured in Asfalturas, un projecto de Carmen Amato in 2012. 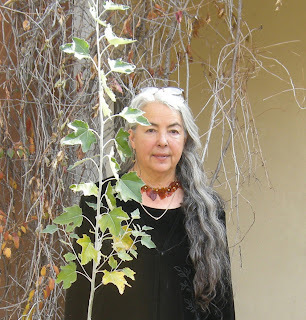 Her last poetic epic work, The Great Salmon Run (Songs of the Fishermen) was a contributing text at the Festival Palabra en el Mundo: Programa May 2012 in La Paz , Mexico and was premiered as a music-drama at the Earth Day Weekend Commemoration April 2012 in Dixon , New Mexico , USA . In addition to her environmental epic poem, she created an orchestra called The Embudo Valley Flowing Stream Ensemble (Water Orchestra). Her photographs, books and orchard culinary works were featured at the Dixon Art Tour, 2012. Her last performance was a vocal presentation featuring her lyrics called A Trillion Reflecting Pools at NNMC (Dec. 2012). Vergara has written and produced a large scale work called Raindrop, an environmental opera. Sylvia Ernestina Vergara is a long-standing faculty member of Northern New Mexico College Fine Arts Department in performing arts. Presently, she is teaching Music and Dance Appreciation. She is on Face Bookand hopes very soon to create her own blog featuring her writings, music, photographs and more.